Ding Dong Devils 2018! Primal! Tribal! Highball! The Ding Dong Devils of Los Angeles perform original songs which celebrate Tiki culture, exotic booze and jungle mystery, inspired by the members’ mutual interest in Mid-Century Modern aesthetic and diverse musical interests in exotica, surf, rockabilly, hapa haole and old-timey jazz. The band features Rama Lama (Edwin Letcher) on guitar & ukulele, Nepheria (Julia Devine) on bass & accordion, Caltiki (Brent Walker) on guitar, steel guitar & sax, Puka von Pele (Rosann Simeroth) on keyboards & percussion, and Eerie Powers on drums. 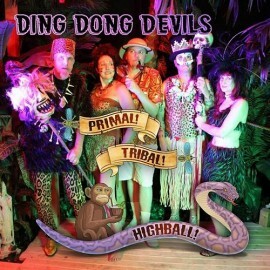 They have released four albums: Tassels, Mai Tai’s & Mischief; Hello, Little Olives! ; Space Fezcapade and now Primal! Tribal! Highball! They have played all over the U.S., including such Tiki events as Tiki Oasis in San Diego, Tiki Caliente in Palm Springs, Tiki Kon in Portland and The Hukilau in Florida.